Dr. Smith graduated from The Florida State University, with a bachelor of science degree in Chemical Sciences. He then matriculated to Life University, where he completed his Doctorate in Chiropractic, while concurrently enrolled and graduating with a Master of Science degree in Sport Health Science, also awarding certificates in Biomechanics of Sport and Injury Management and Diagnosis Assessment for the Chiropractor. Following 4 years of practice, Dr. Smith enrolled in a 3 year chiropractic neurology diplomate, post graduate program through New York Chiropractic College. He successfully passed a written and practical board examination in November 2006, awarding him a prestigious DIBCN status, board certified Chiropractic Neurologist. Dr. Smith completed the curriculum and successfully passed the international board of Electrodiagnosis diplomate examination, granting him a DIBE (Diplomate of International Board of Electrodiagnosis) in 2009. He performs electrodiagnosis, to delineate the source of extremity symptoms from conditions such as: spinal radiculopathy (nerve root compression, peripheral neuropathy (nerve disease) and myopathy (muscle disease). Dr. Smith performs allergy testing, functional blood chemistry analysis, dispenses individualized natural nutritional supplements based upon his findings. Subsequently, Dr. Smith transitions all of his patients toward healthy and fun, innovative health management programs. Further, he is a DOT certified breath alcohol tester, urine collector as well as an instructor. Dr. Smith's goal is to serve the world as a lifestyle coach. He loves to perform workshops and lectures on health related topics. His desire is to show the world how to live well, not just to live long. We bring health related initiatives to all communities. You have nothing to do, but lose2live. 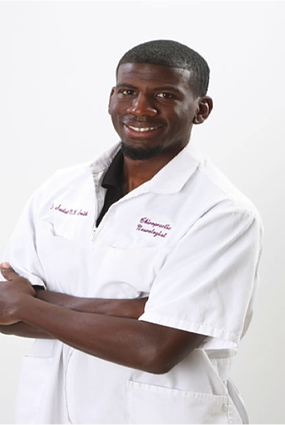 Dr. Sadat Smith has been in private practice for almost 15 years. Follow him through social media, such as: linked-in, facebook, twitter and youtube, which can be accessed through this website or www.drsadatsmith.com. Dr. Smith is Vice president of The Community Action Network, a community based 501c3 nonprofit organization. Their objectives are to expose underprivileged and disadvantaged youth to education (civics, academic, health, economic and arts/entertainment), through various physical activities. He has also developed an entrepreneurial training program, to combine academic education, skill training, with the knowledge and desire to be innovators toward the future. Dr. Smith is also CEO and chairman of Smith Global, LLC, an Orlando based investment company. He is available for public encouragement speaking.